Show: Mesrine: Killer Instinct Released as two separate features—Killer Instinct (113 min.) and Public Enemy #1 (138 min. 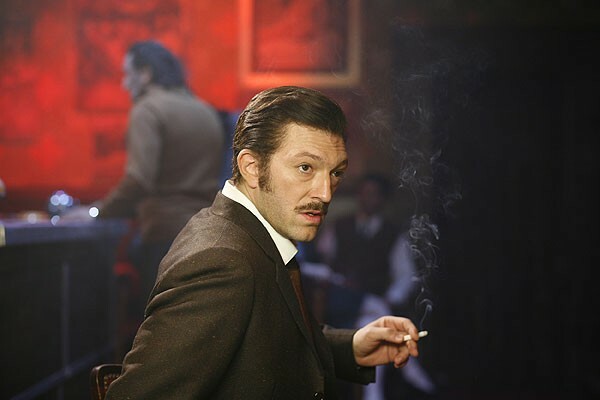 )—the relentless French crime saga Mesrine (2008) traces the international career of Jacques Mesrine, whose seemingly endless string of bank robberies, kidnappings, and prison breaks throughout the 1960s and '70s turned him into a cult hero along the lines of John Dillinger. Dinner: Chilam Balam Twenty-three-year-old Chuy Valencia is only the latest—and possibly the youngest—graduate of the School of Bayless to come out of the Frontera/Topolobampo kitchens and stake his own claim. Show: Lebanon Confusion, terror, shock, and remorse threaten to rip apart a four-man unit of inexperienced Israeli soldiers jammed inside a tank during the first war in Lebanon. "Samuel Maoz drew from his own war experiences to write and direct this searing drama, which ranks alongside Platoon and No Man's Land as an antiwar statement and recalls the claustrophobic despair of Das Boot," writes Andrea Gronvall. Dinner: TAC Quick Young Andy Aroonrasameruang, formerly of Banana Leaf, and his likable staff probably make it easier than anywhere else to get traditional stuff the way it's eaten in Thailand. Show: Fruit Bats On its fourth album, last year's long-awaited The Ruminant Band, this Portland/Chicago combo proves it has plenty of exuberant, focused brainpower underneath its long hippie hair, playing songs that move from pop to honky-tonk to FM-radio muscle-car music with crisp energy and easy glee. Guitarist and composer Nathaniel Braddock—of Occidental Brothers Dance Band International, Ancient Greeks, and Zincs fame—joins in for a one-off collaboration. 8 PM, Old Town School of Folk Music, 4544 N. Lincoln, 773-728-6000, oldtownschool.org, $18, $16 members, $14 seniors and children. Dinner: Klopa Grill & Cafe This flesh-centric Serbian grill in the epicenter of Balkan Chicago distinguishes itself from the many cafes and hangouts in its orbit with an outwardly friendly vibe (no tinted windows, no cold stares from regulars), and though the interior is as bare-bones as it gets, once the crowd fills in you won't even notice. Show: Coliseum, Fight Amp "There aren't many records that embody the desire to throw a cinder block through someone's windshield like Coliseum's recent House With a Curse," writes Miles Raymer. "Their arrangements are sparse enough to show off how dead simple the music is—a three-note guitar riff, a throb of a bass line, some drafty Bonham-in-a-castle drums, a melodic bellow—but the songs hit like a bag of cement." Sweet Cobra, Burning Love, and New Jersey noise rockers Fight Amp open. 7 PM, Reggie’s Rock Club, 2109 S. State, 312-949-0121 or 866468- 3401, reggieslive.com/rockclub, $12, $10 in advance. Dinner: Bertucci's Corner Open since 1933, this Italian warhorse in the heart of Chinatown would seem to have known some hard drinking in its day: the bar runs the length of the dining room, and hundreds of personal beer mugs hang from the ceiling. You can't miss with the sandwiches, especially the perfectly shaved Italian beef. Show: Natasha Leggero "ends every bit with an infectious grin and apparently won't tolerate anything less from her audience. At the Just for Laughs show, she noticed one guy who wasn't laughing and made it her mission to break him, asking him questions and tailoring material to his tastes. It didn't take long for him to giggle," writes Steve Heisler.